I love cooking with cast iron. Yes, I cook eggs in mine. No, they do not stick because a properly seasoned cast iron skillet is the best and most natural non-stick pan there is. That, and I’m not afraid of a little bacon grease or butter. I converted to cast iron a few years ago and I will never go back! I created this handle cozy so I stopped burning my hand on my hot handles. This method should fit any size handle. This particular skillet is pretty small (6″). 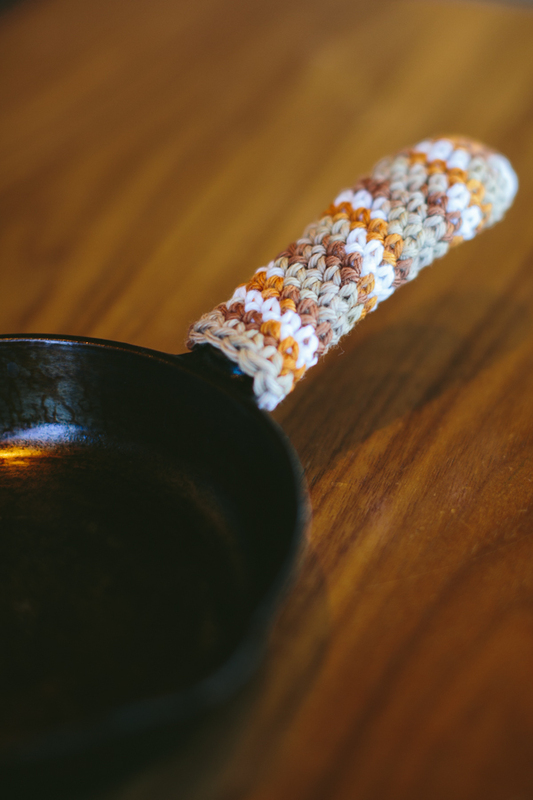 You can find the Cast Iron Cozy pattern you are looking for here on Craftsy for $2.00. Does the yarn absolutely have to be cotton? I don’t think it has to be cotton, but I would advise against using any type of acrylic yarn because it will melt if it gets too hot. I would recommend cotton, wool, linen, or any 100% natural fiber. I hope this helps! That’s wonderful. I hope you enjoy making and using them! Be prepared to have a lot of people coming to your site. I was so excited when I saw this post that I shared it to 2 major cast iron groups on Facebook!! Thank you so much a lot of us were looking for a pattern. What a fantastic idea! Thanks for the free pattern! As a cast iron lover, I can’t believe I made it all these years without a cozy for the handle! It’s brilliant!